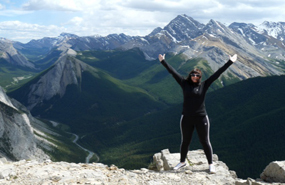 Thank you so much for planning, organising, and arranging such a wonderful trip for us to Canada and the Canadian Rockies in June this year. After you arranged our fabulous Californian road trip in 2015 there was only one person I was going to trust with our next adventure! Our Air Canada flight from Heathrow to Vancouver was excellent. Upon landing in Vancouver we took the Skytrain from the airport to Downtown Vancouver which was exceptionally easy to navigate and I think cost us approximately $5 per person. You booked us into the Rosedale on Robson hotel, a great hotel in a central location for 4 nights. This was a perfect amount of time to experience Vancouver, a wonderful city. 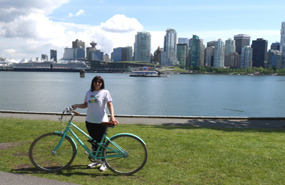 On the first full day we hired bikes and cycled around Stanley Park, an extremely enjoyable way to spend a few hours which takes you around the perimeter of the enormous Stanley Park, bigger than Central Park in New York I am told! On day two we took a very early Greyhound Coach up to Whistler at a very modest cost of £39.38 for a 4 hour round trip. Well, 2 hours each way is a fair distance to travel for a day but let me tell you it was so worth it! 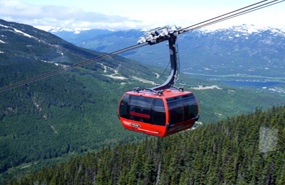 We took the Peak 2 Peak Gondola which links Whistler and Blackcomb Mountains, oh my!! the views …. …….breathtaking!! 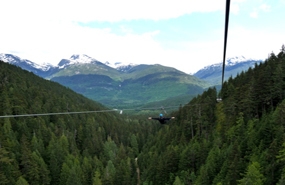 In the afternoon we went Ziplining with Superfly Ziplines. I mention their name because they were so fantastic, very professional and well organised. We flew down a total of 5 ziplines across valleys witnessing the most stunningly beautiful mountain scenery as we went, the longest wire being approximately a mile long. The ‘harnesses’ were extremely comfortable and felt very safe, I would definitely recommend. On our last full day in Vancouver we decided to go whale watching with Wild Wales Vancouver. Sadly we did not see any whales. I mention this because we learnt a valuable lesson and one that others can learn from. We booked our trip on our last available day. Wild Wales Vancouver have more than a 95% success rate for seeing whales and if none are seen they validate your ticket for another day free of charge. We thought the 95% plus success rate was a risk worth taking but sadly did not pay off. The boat trip was still very enjoyable, if a little pricey, and we have lifetime validated tickets for the next time we visit! With hindsight we should have gone on the first day. 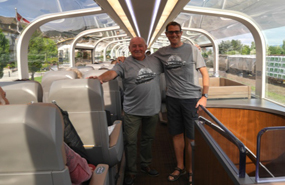 After our last night in Vancouver we were up very early in time to board our eagerly awaited trip of a lifetime on the Rocky Mountaineer train. Oh my goodness!! The service!! As you know Maggie we pushed the boat out here and upgraded to Gold Leaf. It was sooo worth it. We felt like royalty! The carriages! The food! The drink! The staff! The heated seats! We were looked after wonderfully for two whole days. Now, it is quite unlike us to socialise much when we are on holiday, we tend to keep ourselves to ourselves, it’s not that we are miserable we just don’t tend to make ‘friends’ on holiday but on the Rocky Mountaineer we were seated next to the most wonderful couple from Sheffield, John and Lill. We chatted and shared the experience with them and it was fabulous, we even sat with them at every meal which is served downstairs in the dining compartment of our carriage. 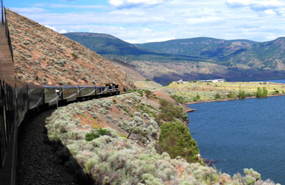 The Rocky Mountaineer took us through the stunning Rocky Mountains, for two full days from Vancouver to Jasper putting us up overnight in the Sandman, Kamloops which was outstanding. Along the way we saw longhorn sheep, ospray, bald eagles and on day two we saw a total of 5 black bears, fabulous! The Rocky Mountaineer has to pull over for the very important freight trains and due to this we were not due to arrive in Jasper until 9pm. Because of this the Rocky Mountaineer put on an ‘extra’ meal for us served at our seats, first class through and through. Upon arrival late in Jasper, we were quite tired, all that eating, drinking and relaxing had taken its toll! but after 13 hours sat next to that super couple from Sheffield, John and Lill, what did we do…. we checked into our rooms quick and then met them in the pub for a nightcap!! Maggie, you booked us four nights in Jasper in the Best Western, a super hotel in an excellent location. 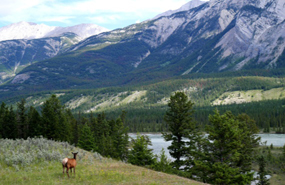 We absolutely loved Jasper and were delighted that we got to spend three full days there. We collected our hire car on the first morning, and due to them not having in stock one of the intermediate cars that we paid for, they upgraded us, free of charge, to a beautiful white enormous Kia Sorrento! Result! We drove straight to the supermarket and popped in for provisions, 10 minutes later we came out to a $65 parking ticket on the car!! Apparently you can’t park next to a kerb that is painted yellow!! That will teach us not to do our homework!! First full day in Jasper we walked the Maligne Canyon trail which was beautiful. 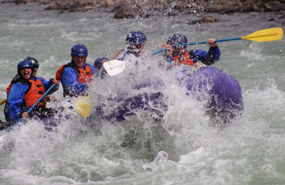 On day two we went grade three White Water Rafting on the Sunwapta River. What a fun and thrilling trip that was, can highly recommend!! The last full day we walked up to the Sulphur Skyline! 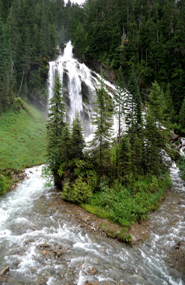 We drove a beautiful journey up to Miette Springs, two playful bear cubs chasing each other ran out onto the road and then back into the trees, it was a wonderful sight to see. We also saw Elk and Deer just grazing at the side of the road. We parked at Miette Springs and walked from there, I think it is only about 5 miles up, but it’s steep. There is little to see on the way up, mainly trees, but my goodness when you reach the top!! …..awesome!! !, so worth the hard slog up. 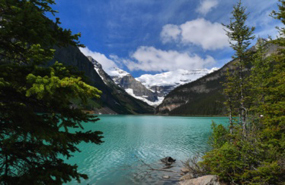 It was time to leave Jasper the next morning and drive the Icefields Parkway. Some class it as the most beautiful drive in the world and I can see why. 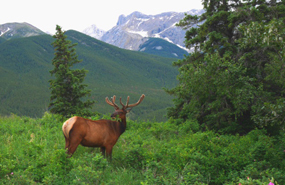 Just wall to wall beautiful Rocky Mountains, trees and wildlife. We stopped at Athabasca Falls on the way…wow! We also stopped at the Columbia Icefields, beautiful and absolutely freezing. We made one final stop at Peyto Lake, oh my!! 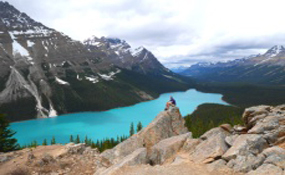 ….Peyto Lake just has to be seen to be believed with it’s beautiful turquoise water. 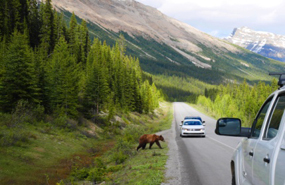 It was along the Icefields Parkway that we saw about three cars pulled over at the side of the road and, thinking it must be a wildlife sighting, we pulled over also. So glad we did! A young Grizzly Bear was grazing on the verge right next to the highway; we watched him in awe then saw him look up and cross right over the road in front of us. Wonderful! You booked us in for a couple of nights in the lovely Lake Louise Inn. We walked right around the lake and it really is a beautiful place. The Fairmont Inn sits in prime position overlooking the lake which really was beautiful, but my goodness it is a popular area!! The volume of traffic around Lake Louise was immense. 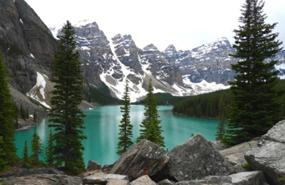 We also drove out to Lake Moraine which again, was breathtakingly beautiful. It was then time to move on to Banff. You booked us into the fabulous Banff Caribou Lodge, loved it. 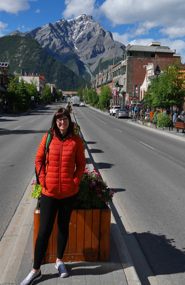 Banff is a larger town than Jasper, beautifully located in a valley with the Rockies all around. It is obviously a very popular place as it was exceptionally busy, but we managed to get around easily and as you said Maggie, the shopping was good! After our three days exploring beautiful Banff it was time to head off to Calgary, where we took our Air Canada flight home. Maggie, I can’t tell you how happy I am that I put my Canadian holiday of a lifetime in your more than capable hands. From start to finish all your suggestions and choices were absolutely spot on. Canada is a wonderful country, immaculately clean with very friendly people and having you to help it all run like clockwork was priceless. In fact the amount of people I have told about your services I am sure you will have a Canadian holiday rush on soon! !